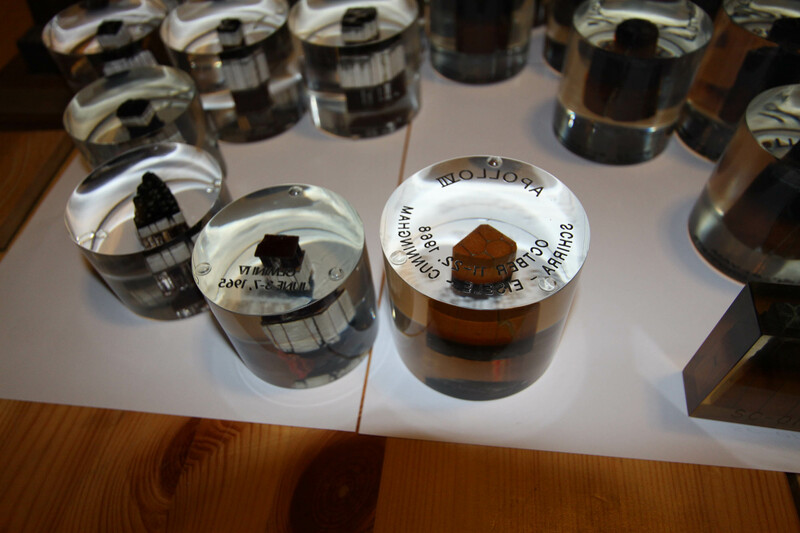 Lucites made for an astronaut using material from their personal collection (such as the Apollo 17 Kapton lucites made for the Cernan Corporation). The lucites that I consider 'official' are the ones made by/for NASA. These lucites are vintage; they were made shortly after the flight to present to NASA, government and contractor personnel and, in my opinion, have the best provenance. That being said, I also believe that lucites made for museums that restored spacecraft (for example the Kansas Cosmosphere) and organizations that receive artifacts from astronauts (the Astronaut Scholarship Foundation) also have impeccable provenance. And let me make it clear that I'm not saying that lucites made by someone other than NASA, museums or aerospace-related organizations are suspect; I'm simply saying that if I had to rate provenance on a scale of 1-10 I would give those sources a 10.
one with just the mission name and mission dates engraved in black, one with the astronaut's names, mission name and mission dates engraved in black and one with the mission name and mission dates engraved in white. 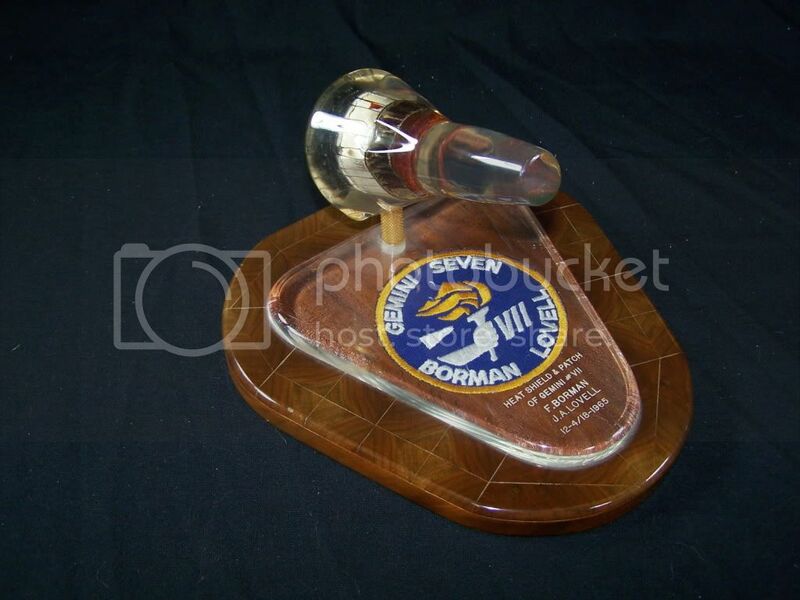 I've also seen three versions of the Gemini spacecraft shaped lucites; one with the lucite, representing just the manned section of the Gemini spacecraft mounted on a polished wooden base without a patch embedded in the base; one with the lucite, representing just the manned section of the Gemini spacecraft, mounted on a polished wooden base with a vintage mission patch embedded in the base, and one with the lucite shaped like the entire Gemini spacecraft, including the retro module and equipment module (I've only seen one of this style). Other than the lucites containing heat shield material I haven't seen any other 'official' lucites for the Gemini missions, and I haven't seen any collector/dealer or museum versions with Gemini artifacts either, but I have seen a couple of lucites made by individuals who worked on the Gemini program. 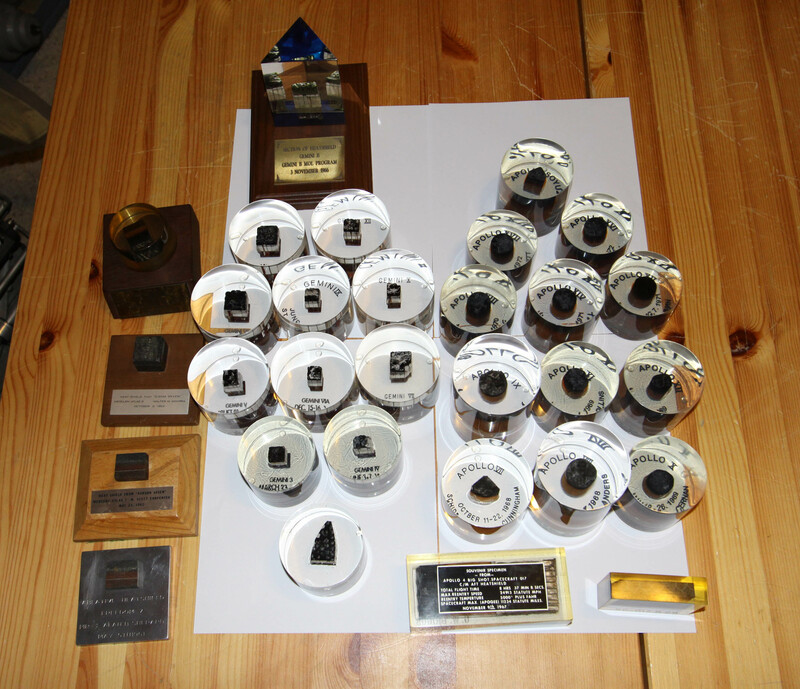 Regarding Apollo artifact lucites: other than the one that is in my collection in the shape of the command module, the only 'official' lucites that I've seen are the 'short' cylinder (or 'hockey puck') lucite used for pieces of Kapton or ablator plugs, 'tall' cylinders with a section of heat shield and 'short' cylinders with a section of heatshield. There are also two different diameter 'tall' cylinders depending on whether the artifact is a section of heat shield or a heat shield plug (these are threaded ablator plugs with a metallic bottom used to cover the bolts that secure the heat shield to the primary structure of the Command Module). Other than an Apollo 13 lucite that contains a vial of heat shield particles and has the mission name, mission dates and a description of what's in the vial engraved in white all of the Apollo lucites that I've seen are engraved in black. I've also seen two different versions of the Apollo 10 heat shield lucite; one with the names of the astronauts, mission name and mission dates and one with just the mission name and mission dates. 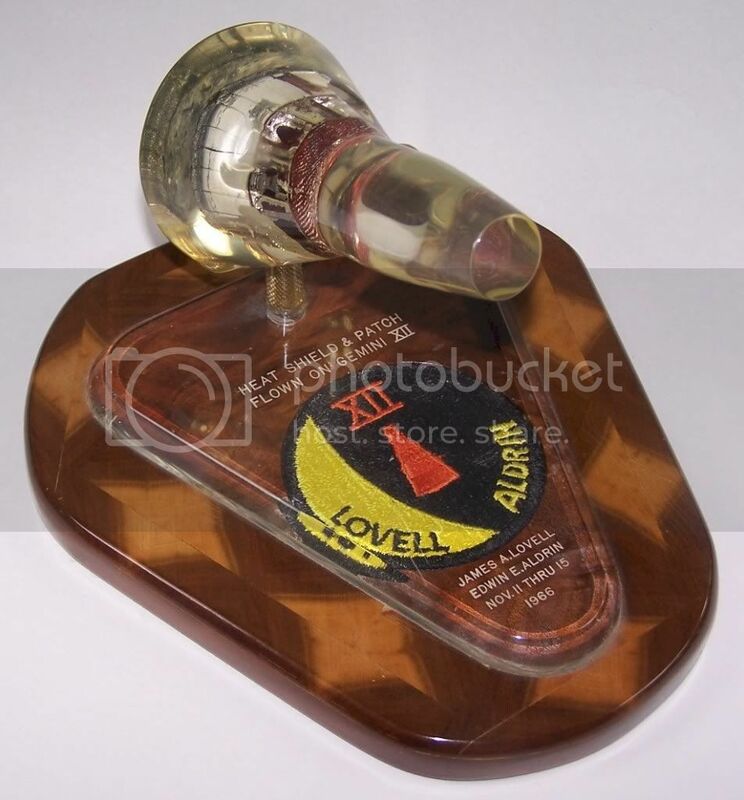 I believe that all of the other Apollo heat shield lucites have the astronauts names, mission name and mission dates engraved on the bottom, and all of the heat shield plug lucites only have the mission name and mission dates engraved on the bottom. In addition to the lucites containing heat shield material and heat shield plugs I've seen 'official' lucites with Kapton material, ablator plugs, a section of wiring from the LM (from Apollo 10 and Apollo 15) and a timer knob (from Apollo 13). I haven't seen any 'official' lucites containing heat shield material for Apollo 12, 14, 15 and 17, though they may exist. One more thing: I have seen heat shield and Kapton material lucites made by collectors/dealers for all of the manned Apollo missions, and they look very similar to the 'official' versions. 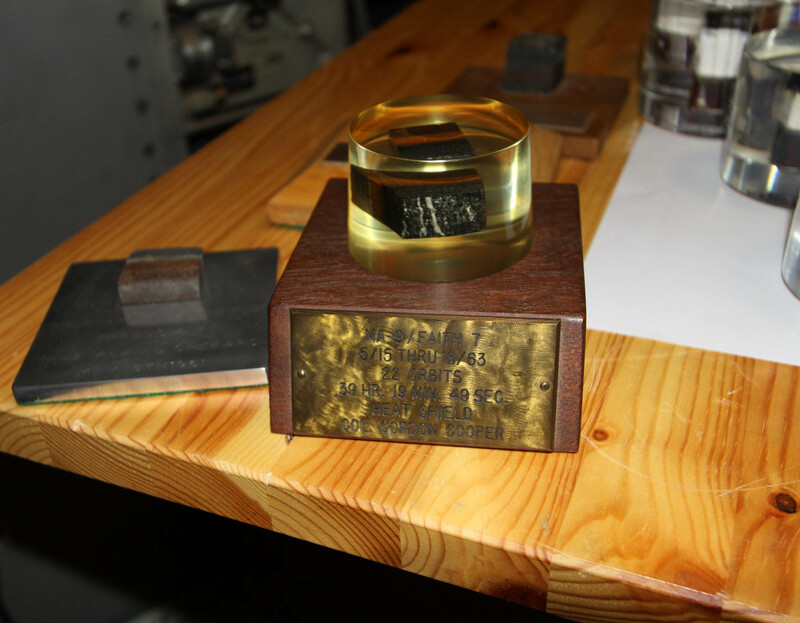 In most cases the lettering is slightly different than the 'official' versions, and in at least one case the order of the astronauts names engraved on the bottom of the lucite is different from the 'official' version. These lucites look so much like the 'official' versions that if a collector doesn't know exactly what to look for they may think that it is an 'official' one. I hope that this post helps fellow collectors who collect lucites with flown artifacts. I'm sure that there is additional information that other members of collectSPACE can add and I look forward to their comments. Update: After posting the above message I thought of some additional information. 1. There's a seventh category of lucites with space flown material - lucites made by a contractor for presentation to it's employees. For example, there's a 'diamond' shaped lucite with a small round section of coldplate flown on Apollo 8 made by the contractor who supplied the coldplates used in the CM . I don't believe that it was made for NASA but was made to give to employees who worked on the program. 2. There are lucites shaped like the Apollo CM that contain Kapton and/or heat shield sections that are flat on one side. I've seen two different versions of these lucites; one with a metallic plate with mission information facing the front of the lucite, and one with a metallic plate with mission information facing the back of the lucite. These were made for the CM prime contractor, North American Aviation/Rockwell. I don't know if Rockwell had these made for NASA or if Rockwell made them for their own use. 3. 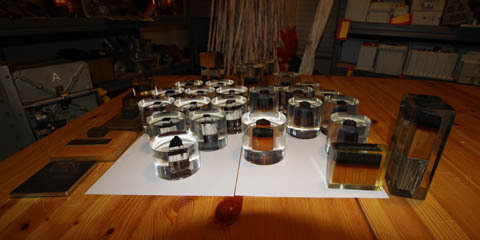 There are also rectangular shaped lucites containing flown Apollo heat shield material. I've seen these lucites for Apollo 4, 6 and 7. These were made for NAA/Rockwell and again, they may have been made for their own use. As time permits I will post photos and dimensions of several of these lucites, and I encourage other members to do the same. Editor's note: This discussion was split off another thread. Like your type definitions Randy and subject to additional input/refinement from the rest of the cS community perhaps we can adopt as terms of reference throughout subsequent discussions of this issue (very analogous to the way autographs have been characterized in another forum). Also to provide a good reference for other collectors, recommend we upload images of each type to include suspect "imitations" of official NASA/contractor issued lucites. I am curious how you have come to establish your baseline understanding for example in the case of the "Type 1" hockey puck lucites, which are the official and which are the imitation? What sort of traceability would lead you to conclude that a given lucite came out of NASA or the contractor? Also - for the NASA lucites, I am interested in learning whether they had an in-house ability to produce the displays and if so where that would have been accomplished (which NASA center vs the possibility they were sent off to a commercial vendor who made them on NASA's behalf) and perhaps any employees that were involved in their production so we can obtain some ground truth from those who actually manufactured these as well as total quantities produced. To assist with a visual reference, I have hockey puck lucites from every Gemini and Apollo mission though given your revelation that close imitations exist, must confess I am now uncertain about their true provenance so this will be a good educational experience for me as we sort through this. I'd be more than happy to incorporate info like this into my Space Flown Collectibles site. There is already an entry in the main menu for this category of items but I've never had the time to try to tackle it. I'd need a good photo and details (dimensions etc) of each type of presentation, and of course the content of the page would be entirely credited to the author or authors. Note that the engraving on the base of the Gemini 12 presentation states that the patch was flown, but there is no such engraving on the base of the Gemini 7 or Gemini 11 presentations. That being said, the odds are that since these were made by McDonnell Aircraft for NASA and that NASA sent them flown artifacts and patches to use for official presentations there is a good chance that the Gemini 7 and Gemini 11 patches were flown. However without any other provenance I'm assuming that the patches were not flown. How have you been able to establish the above lucites were contractor vice privately produced? These examples are exactly the same as the ones that were given to the astronauts (even the pattern of the wood grain in the base is the same). That can be confirmed by looking at past auctions: a Gemini 3 heat shield presentation from John Young's personal collection was in a Heritage auction as was a Gemini 12 heat shield presentation from Jim Lovell's personal collection. Both presentations were exactly the same except for the inclusion of the vintage patch. I also know that these came from the personal collection of the McDonnell Aircraft employee who made these presentations for NASA. McDonnell Aircraft was the prime contractor for the Gemini spacecraft. It is my understanding the above, spacecraft shaped Gemini lucite displays were made in very limted numbers, by a McDonnell Douglas machinist by the name of Norm Pavey. I guess technically he made them for McDonnell Douglas who then distributed them to NASA. Here is a sub-collection of mostly "cylinder" lucites inclusive of GT2-GT12 and MOL; and Apollo 7-17, ASTP. One of the Mercury ablators is also encapsulated. Most interested in learning if these are true type 1 variants or perhaps privately produced. 3rd image shows the bottom of a couple of these - all with the exception of the GT-2 (which has the mission marked on its side) are imprinted/engraved (?) on the bottom with the mission data. Substantial credit is due to cS member David Worrow who with the assistance of his Father-in-Law (British Aerospace employee Peter Bunting who served as a liaison to NASA in the late 60's/early 70s) is responsible for the original assembly of much of this sub-collection. Click on each image for a higher resolution look. Excellent topic here guys, with some fantastic lucites displayed above! There is a gorgeous lucite at the Space Walk of Fame in Titusville that has a segment of both the GT-6 and GT-7 spacecrafts. It is quite impressive and I can't recall ever seeing another. 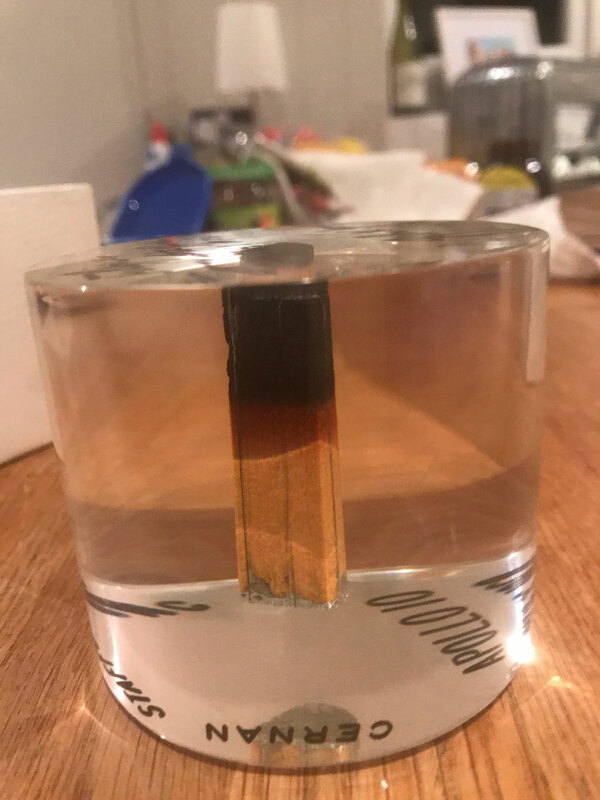 I have a photo of it on my hard drive but I am embarrassed to post it because it is slightly blurry, but have any of you ever seen a lucite with whole heat shield segments from multiple flights in it? Might the one in the Space Walk of Fame be a literal one-of-a-kind? 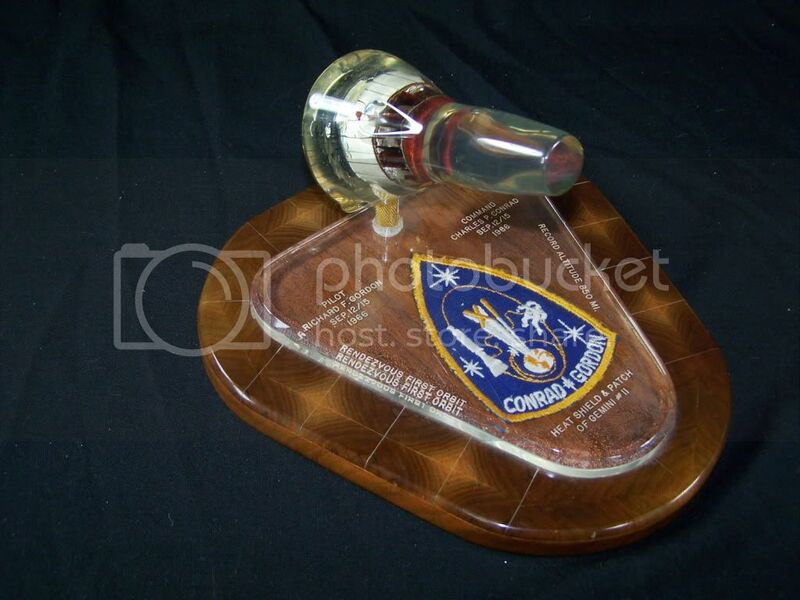 I also saw the Gemini 6/7 lucite that's at the Astronaut Walk of Fame Museum in Titusville, and saw a 'double' lucite presentation with heat shield segments from the two missions in Gemini spacecraft shaped lucites mounted on a single polished wood base. I had an opportunity to purchase that presentation and I'm still kicking myself for not buying it! The upcoming Goldbergs auction lot 460 (Skylab III heatshield lucite) includes a memo originated on NASA/JSC Form 1183 from the Awards Office stating that "the Center Director authorized the distribution of Apollo Heat Shield Cores from the three Skylab missions as a memento to employees and former employees." This would seem to affirm an officially sanctioned practice within NASA of producing at least some of the lucites which ultimately wound up in private collections. Here is an Apollo 10 lucite. When I bought this a number of years ago I was delighted with my addition especially as it came direct from John Young. I thought nothing of the box it came in, I could have easily thrown it away. Thankfully I didn't. A conversation with Tom Stafford revealed that each astronaut was presented with five or six of these at the end of the mission. Nice mementos to have. So it would appear that the box is original and the lucite is as clear as the day it was made. So it must have been stored in its box for a long time. Does anyone have any history on how these lucites were made? Was it just one manufacturer? Yes, the box is original to the lucite. More often than not the box is discarded... good on you for bucking the trend and saving it! It does a great job protecting from scratches and having one fresh out the box is a real treat. Several sizes of boxes were used to best protect the item after manufacture and during shipment, a few examples below. 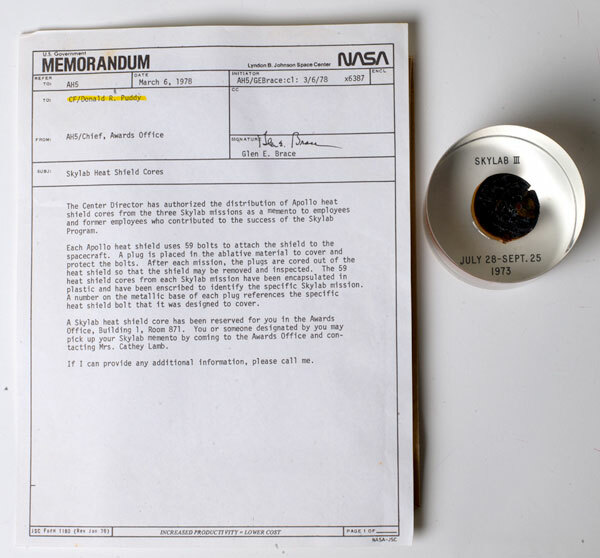 Surprisingly enough, a letter between NASA and Clearfloat was auctioned on eBay in March 2014 along with a small "puck" lucite containing an unmarked artifact as a prototype for production acceptance. Unfortunately I don't have a photo of the letter or otherwise I would share here. Maybe the owner of the letter will read this post and they could graciously add a scan of it for reference. 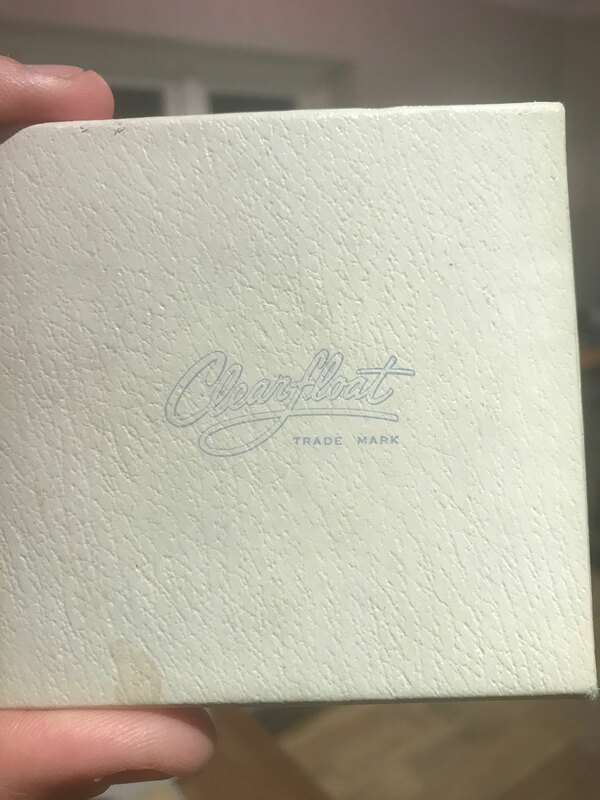 Some additional information on Clearfloat, their trademark, and an informational card often inserted into the boxes.